Whether you do it for business reasons or purely pleasure, blogging can be an activity that is extremely empowering, fun and informative. However, it also carries a great deal of responsibility, which is especially true if you are a blogger who has built up a large amount of recognition in your industry or in your topic of choice. In that case, it’s highly likely readers will respect what you have to say. However, it’s also possible some of those readers may not be happy with your views and may even try and sue you. Fortunately, there are several laws in place that relate to blogging, and if you are well educated about them, it should be easier to protect yourself from potential legal troubles. Depending on the type of blog you have, you might often write content about particular products or services and provide feedback on them by writing reviews. That type of blogging is particularly useful if your target audience is generally a group who likes to spend less, not waste money on things that aren’t what they expected — or both. If you have a relationship with a product or company, the nature of it should be clearly disclosed. You must make clear distinctions about which parts of your content are editorial, and which are related to advertising. This Act does not apply if you are reviewing a product you purchased yourself or you received for free. If you need further information about how to handle endorsements while blogging, the FTC has provided some guides written in easy-to-understand language. Bloggers often deal with the concept of fair use, specifically when they are quoting work that has been published. Fair use is precisely what is dealt with in Section 17 U.S.C. § 107 of the U.S. Copyright Act. If you are using content for the purpose of studying, researching, reporting the news, making a criticism or comment or teaching, the ways you are relying on the content should fall under fair use. The legal system in the United States favors transformative uses, meaning those that are needed in order to produce commentary on the subject or using existing content in a new context. This section of the law is also important if you use images on your blog, including those found on social media sites. Legal experts have warned using those improperly could be a risk to another person’s intellectual property. Up until 1989, copyrighted works were required to have either a copyright symbol or a textual declaration of an existing copyright. However, the law has evolved. Now, something is considered copyrighted as soon as it is created — or in other words, when you write a blog post. Although that may seem comforting, it’s still in your best interests to go through the process of making sure your content has visual copyright indicators, just in case you ever get involved in a lawsuit. There are numerous specifics relating to copyrighted work, and it’s a good idea to familiarize yourself with them — especially if you intend to have a long-term blogging career. Understandably, you may be under the impression that if a person makes a comment on your blog, you also own the copyright to that opinionated content. However, that’s generally not true. Comments usually fall under a category known as user-generated content. Put simply, the person who makes a comment is the copyright holder of it. However, you can solve that issue by putting language to the contrary inside a terms of service agreement that everyone must abide by before posting their views. If you have things set up in such a way where it is impossible to provide feedback on a post without agreeing to that terms of service document, you’re protected in the event a commenter tries to engage in a dispute with you over the fact that you own the copyright. If they to claim unawareness, all you have to do is point to the fact that agreeing to the terms of service is a necessity for all users before they publish comments on your blog. Some people don’t consider blogging a profession and merely do it as a hobby. However, if you are making money from your blog, there’s a good chance you’ll need to pay federal taxes on that income. If you are blogging on your own and not for an employer, you’ll need to pay estimated taxes every quarter. However, if you don’t anticipate making more than $1,000 in a year, you may be able to avoid that estimated tax obligation. Also, as far as the IRS is concerned, if you write your own blog and make money, you are a business owner. That means you also need to set aside money to cover self-employment taxes. If this makes you feel discouraged because it seems like you won’t actually have any income left over after paying taxes, don’t be too concerned just yet. Keep in mind, many of the items you use while blogging could potentially be written off as business expenses. Just be sure to keep your receipts. Possible examples of valid business expenses include computers, software, printers, writing and general office supplies, Internet service bills and mobile data charges. Because the area of tax law is so complex and changes yearly, it’s a good idea to meet with a well-qualified accountant so you can discuss the particulars of the way you use your blog to make income. In some cases, the accountant may fill you in on lesser-known subjects within tax law, such as how to take a home office deduction. However, if you want to get educated before that first meeting with an accountant, there are many reputable online resources that can explain the basics of tax law for bloggers in language that’s layperson friendly. 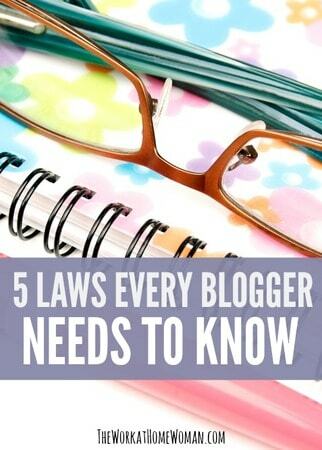 Laws can certainly be complex, but hopefully, the information above has proved it’s easier than you might have imagined to at least get acquainted with the legal information most relevant to your work as a blogger. The more informed you are, the more you should be able to feel confident about expressing your thoughts without unnecessary fear of legal repercussions. What Should You Do When Someone Steals Your Content? Disclaimer: Unless otherwise specified, authors of The Work at Home Woman are not licensed legal, financial or medical professionals. The information on this website is provided for informational purposes only, and should not be construed as legal advice on any subject matter. If you need specific legal advice, consult with an attorney who specializes in your subject matter and jurisdiction. Thank you so much for this great info! I am getting back into blogging after one time off, and appreciate the content! Thank you so much for making this post understandable for those who are not familiar with the law field. As a new blogger, I highly appreciate this post. Glad you enjoyed the tips, Geraldine. I bookmarked this article a year or so ago because at the time I was thinking about starting a blog. Well, here I am actually starting and this is just what I needed. It’s amazing how little info there is on the internet about the legal part of blogging. I see this was written in 2015. Do you know if anything has changed in the laws that we should know? Thanks for a great, and very helpful, article. Congrats on your new blogging journey! I don’t believe there have been any changes to these laws. I really found this article helpful with writing my own blog. Thank you. Glad you enjoyed Sarah’s article, Stephen! As a brand new blogger this was helpful. Sometimes doing GroovyGrubGal.com I get to feeling over whelmed. Thanks for the info! Glad you enjoyed the information, Kimber. Great post with alot of information I don’t see shared often. Thank you for sharing! Glad you enjoyed the article, Erin! 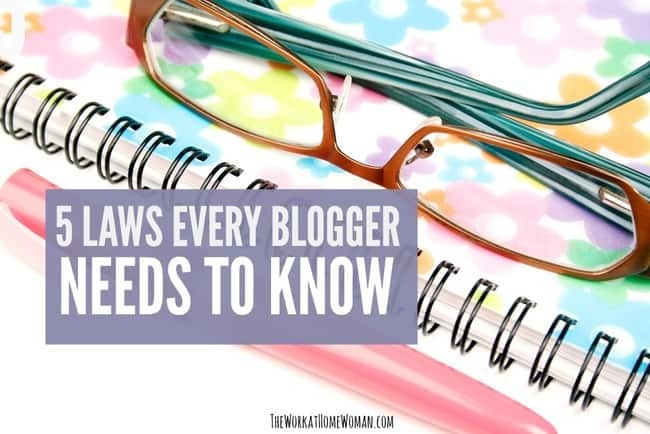 Thanks for posting, very helpful to new bloggers!